The night bus, like all night buses, made about five stops, including a lengthy dinner stop, before it finally got going. It also got stuck in the snowy mountain pass and we had to wait for the machine to crawl through and clear the road. At that point, I thought we’d be stop-and-start through the mountains until morning, but surprisingly, it was only an hour delay. At some point my ipod ran out of power and I thought I’d be awake all night, but shortly after that, I conked out and woke in daylight. It was the most restful night of sleep I’ve ever had on a bus, actually. When we alighted in Fez, we took a cab to the medina area, and then walked around looking for a hostel. It took us a long time to find one. We were bleary-eyed and sleepy, it was early, and most of the people of Fez were pouring along the sidewalks on their way to school and work. When we found a hostel, the room wasn’t quite ready, so we walked into the medina for breakfast. We sat at a cafe and had really delicious Berber coffee and an omelet and a crepe with honey. Then, we returned to the hotel and had showers. After that, we decided to take care of all our errands first and then spend the day wandering around the medina eating everything in sight. Which is exactly what we did: we found an internet cafe and checked our bags on Ryanair (they’re significantly less expensive if you check them online in advance) and then we went to the post office and mailed our post cards. Then, we walked all over the medina buying last minute gifts and eating a lot of things. We ate strawberries and avocado shakes and fried sardines and some sort of thick, sweet yogurt and fried honey pastries. We walked through to the courtyard where we’d sat before, and then back to the blue gate. By then, the sun was setting, so we had some tea and wrote in our journals and sat for over an hour watching the people walk past. We had some fantastic pureed fava bean soup, more fruit shakes, dates, and another round of those sandwiches. Eventually, it was time to leave, and we headed back to our hotel, where they’d called a car to take us to the airport. After inexplicably screwing up several times in the customs line, having our pen explode all over everything and getting yelled at a lot, we finally boarded the plane…and sat there for nearly two hours while we waited for ice on the wings to melt. This Ryanair flight was only slightly less insane than the last one. We were staying with friends of R’s in London who had to work in the morning. We were supposed to take a bus to their house when we arrived in London, and then they would pick us up at the bus stop, but when we finally got to Stanstead, it was nearly 2am. We had been unable to contact them to even let them know we would be late, so R called from a pay phone now and told her friend, W, we’d just take a cab, but W said that would be very expensive and to just take the bus and call when we got to the station. So that’s what we did. W and J, an incredibly nice couple, picked us up at nearly 4 in the morning and took us to their apartment, where W got out this huge, delicious Sri Lanken feast she’d made before they went back to bed. We were really happy to be there. We ate and then I had a shower, and then we went to bed, but R was so happy to see her friends that she got up at about 7:30 to talk to them before they went to work. And then I got up, because I realized we were in London, so we just went ahead and got dressed and headed out. We took the subway to the area where Big Ben and everything are, and we walked around there and over the Thames. We were so tired that everything seemed really surreal. Then, we walked to Borough Market, where we spent a couple of hours sampling food. They had a lot of mulled cider stands, and we each got a huge cup of that, and I realized quickly that I was getting really drunk – after all, we hadn’t had an alcohol in two weeks. This did not help with our exhaustion. We also had some very yummy pumpkin tortellini, after which, we really hit a wall. We took a bus to somewhere near Picadilly Circus, and then we sat in a Pret drinking coffee for awhile, and then wandered around some more in a fog. This was my first time in London and I hated to spend it like that, but I was too exhausted to enjoy myself. And I’ll go back to London some day, anyway. It’s not exactly an unstable country or anything. 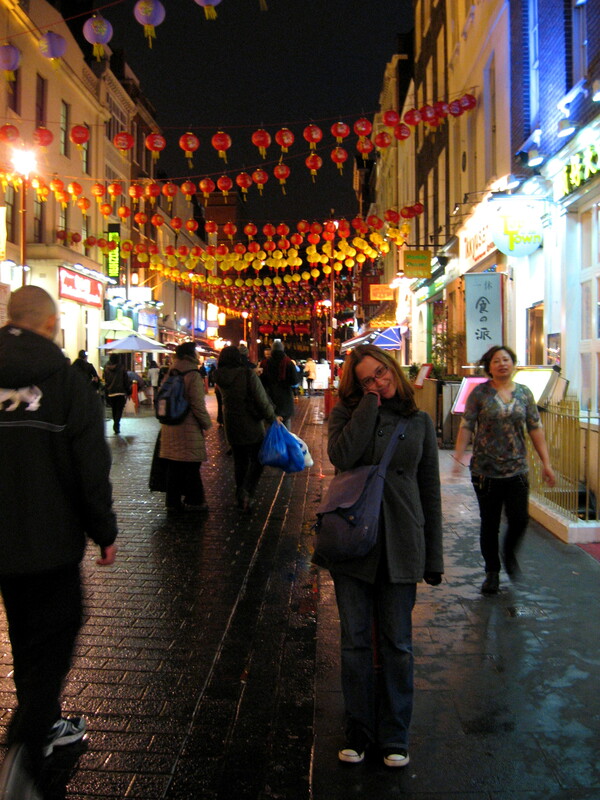 Then, we met up with W and J, who’d gotten out of work and they treated us to a really nice dinner at a Chinatown restaurant, after which, we took the train back to their apartment and sat up late discussing health care, as Brits and Americans tend to do when they get together. The next morning, R and I caught a cab to Heathrow and boarded the plane. I was exhausted, but I didn’t sleep very much. I did watch The Social Network. When we finally arrived in New York, we tore off the plane and joined the customs line, where we had an aggravating experience, but at long last, we were done with that, and emerged into snowy, freezing, February New Jersey. Ah, to be home! Personally, I would have been happy to turn right around (although I was very glad to reunite with Thomasina). Two weeks is maybe not enough time for me to travel, but it’s better than nothing. All in all, it was a great trip, and highly affordable – I took out $275 the first week we were in Morocco and $350 the following week (including bank fees), and that was all I spent for the whole two weeks we were there, including trains, buses, taxis, hotels, food, hammam and multiple tours, among other things. And we could have done it even cheaper – this involved us not bargaining at all or looking very hard for cheaper options, but just spending freely and not worrying much about anything, and we still didn’t end up spending that much. Our flight to London was a little over $600, which was the best fare we could find, surprisingly (flights directly to Morocco from New York were all at least $900-something, and mostly more than that), and the Ryanair flight to Fez ended up probably being about $100 each because of the baggage fees, but if we’d planned for that better, it would have been $19 there and $25 back. We didn’t spend much in London, either, because W and J put us up and even fed us (twice!). If you are thinking about going to Morocco, I would recommend several things, the main one being, maybe wait a bit. But other than that, I’d say to brush up on your French, bring a compass and a good map, and then rent a car. Morocco is spread out and the best thing about it is the extremely varied, dramatic landscapes. Having your own vehicle would free you from having to spend all your time with creepy people in the tour industry, being forcibly taken to rug shops and hit up for small sums a hundred times a day. With a car, you could go where you wanted on your own time. There’s not much traffic at all anywhere, and apparently foreigners don’t get bribed by the police. Most places we went, there were big caravans of European senior citizens driving camper vans with their dogs and everything. Morocco is a cheap winter escape for retirees from the North country, and apparently there are a lot of inexpensive campsites everywhere to park if you’re traveling this way. I think doing that would be a whole lot of fun, and if I were to go back to Morocco, I’d probably rent my own vehicle and just hit the road. But if you’re not confident in your driving skills, I’d still recommend Morocco. No matter how you do it, definitely make the effort to go to the desert (assuming you haven’t been before), even though it’s a whole long day’s travel there and back. It’s definitely worth the time.